Josh Visser grew up in Penticton, BC and got into freestyle skiing at his home mountain of Apex Mountain Resort. He got into skiing at the young age of 4 and has never left. After graduating the ranks of the Apex Freestyle Ski Team, he moved up to the British Columbia Park and Pipe team and traveled all over Canada and the US for competitions earning podiums at various provincial and national level events. After suffering a torn ACL, he decided to retire from competition and fill the gap at events as an event announcer. As young as 12 years of age, Josh was announcing local freestyle ski events at his home mountain in between his contest runs. 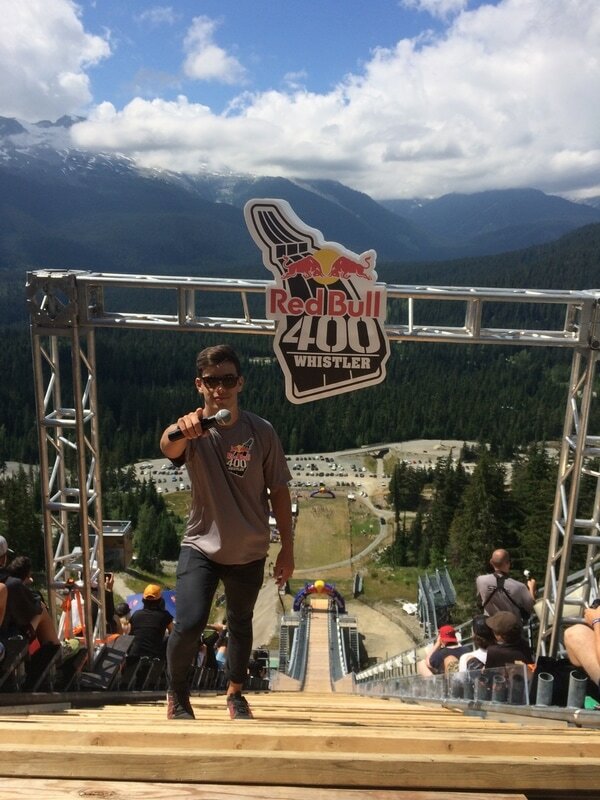 Since retiring from competition, Josh has emceed all sizes of Freestyle Skiing, Snowboarding, Mountain Biking, Triathlon and Adventure Race events in western Canada and the US. Some previous events include the FIS Freestyle World Cup in Deer Valley, Utah, Ironman Canada Penticton, The Red Bull 400, The Dew Tour Amature Series and the BC Mountain Bike Cup to name a few. Josh currently is the weekly host of the Fire and Ice Show in Whistler, BC. The weekly show is comprised of some of the top skiers and snowboarders in Canada jumping through a ring of fire to thousands of spectators every Sunday evening in Whistler, BC. As the emcee, Josh is responsible for crowd interactions, sponsor contests/integration and informing the crowd on the tricks and spectacles of the show. In addition to live event emceeing, Josh has also hosted live stream broadcasts for NBC Sports as a part of the 2017 FIS Deer Valley World Cup. Josh is the youngest member of the Backing Events & Sports Team and always brings high energy, humor and entertainment to every event he is involved with while educating every audience big or small.